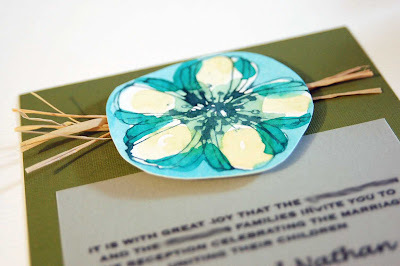 Seeing as it is the beginning of wedding season, I thought I would post a tutorial for the wedding invites that I made for my wedding last summer. They are extremely easy to make and ended up saving us a ton of money! -A stamp that matches the theme for your wedding. -'Sticky-doos'- Those 3-d cushions with stickies on both sides of them. -Envelopes to match your color scheme. Cut your cardstock to size (make sure it will fit in the envelopes you got!) 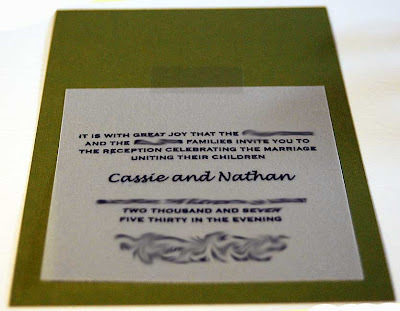 using a paper-cutter and print out your invite information on the vellum using your printer. I printed six per page, so I didn't need that much vellum. Then just affix the vellum to the cardstock using plain old scotch tape. Make sure your tape isn't larger than the stamp you are using or you will see it in the finished invite. 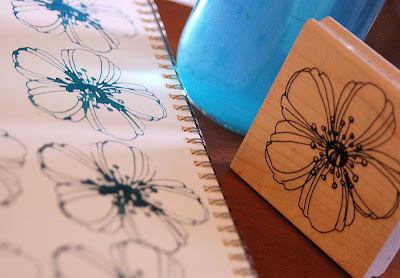 Get out your watercolors, watercolor paper, brushes, stamp and water. 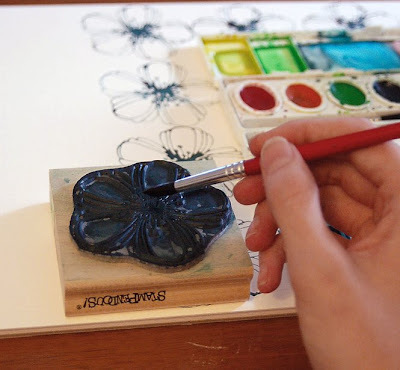 Mix your paint really thick and paint it onto your stamp like shown. Make sure not to let the stamp get too waterlogged or your image will be distorted. Fill your whole sheet with as many as you will need leaving a little space between them. Make sure the stamped images are completely dry before moving on to the next step. You can use a blowdryer to quicken the drying. After the stamped and painted images are dry, cut them out. 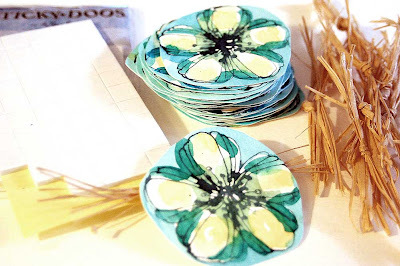 Also take your raffia and make little 'ties' with it. 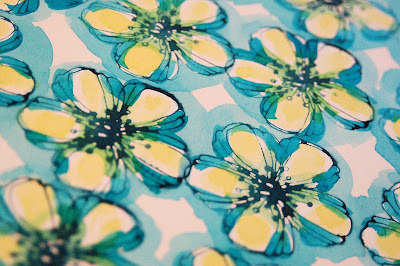 These will go behind the watercolor flowers. Assemble your flowers! 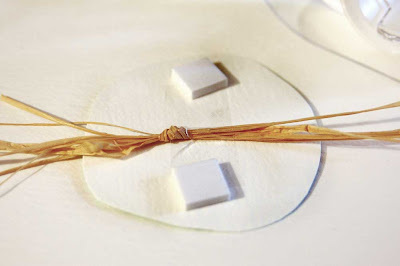 Use your Sticky-doos to give the flower some 3-dimensionality and tape the raffia bowties to the center to hold it down. Stick on the flowers! You are now finished - you may wallow in your creativity! If you would like to post about this tutorial on your website or blog, please include a link back to this entry. Hope you like it! Also, if you have any questions, just leave a comment! Thanks Cassie :] I love your shop so much. You have the cutest stuff! Oh wow, thanks for the tips! I'm still trying to figure out what to do for mine...and I know I'm making them on my own. Thanks for the inspiration and tips! 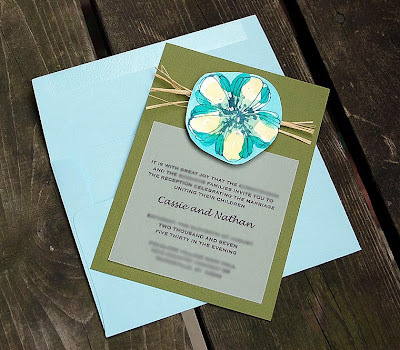 My colors are going to be lime (or seagreen) and gold, for an October ('09) wedding. Anna--I can't wait to see yours when you do get them done, I hope you post pics on your blog!! I'm sure they'll be wonderful! Very cool, you make it look very easy and non-intimidating, which is nice. Where did you get your cardstock, any suggestions? Cool. I might have to ask about some ideas later. lol. You seem to be a whole lot better at the paper-crafts! I got my cardstock at Hobby Lobby, but I know they carry the same stuff at Michaels. It was textured paper that almost looks like woven fabric.